A British Oceanographic Data Centre (BODC) Data Scientist, Mike Nelson, took part in the RRS Discovery cruise D365 in the Northeast Atlantic Ocean. He joined a team of marine scientists from various centres to make measurements along the Extended Ellett Line. The Extended Ellett Line, an oceanographic section that runs from Scotland to Iceland, crosses the main pathways of warm, salty water flowing towards the Arctic Ocean. It is important for investigating oceanic climate variability and is one of the few long-term monitoring datasets in the North Atlantic Ocean, with measurements being collected along the section at regular intervals since 1975. With over 80 cruises having worked the Ellett Line and the Extended Ellett Line, BODC provides access to a wealth of data from this section. For most people, the word 'cruise' conjures up images of cocktails and sunbeds. 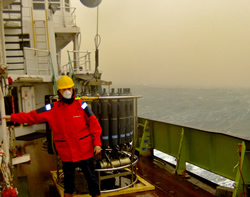 However, the reality of a research cruise - particularly in rough seas - is very different. Imagine completing your daily tasks whilst riding a Big Dipper; even sleep becomes impossible for all but the hardiest of seamen! On cruise 365, after sailing through the relatively sheltered waters of the Irish Sea, Discovery headed out to the west coast of Scotland to start the planned data collection. Almost immediately the forecast storm force winds (~ 65 mph) struck. With conditions too dangerous to deploy the scientific equipment, she was forced to seek shelter among the islands of the Hebrides. To avoid the worst of the weather, a decision was made to sail north and restart the sampling programme working along the section from Iceland toward Scotland. Unexpectedly, this route took Discovery straight into the ash cloud from the recently erupted Grimsvotn volcano! Filthy but unscathed, she eventually made it to Iceland's jagged islands and the fabled 'midnight twilight'. From then on it was plain sailing and, despite mother nature's best efforts, most of the planned scientific work was completed. Why do BODC take part in research cruises? While onboard a research cruise our Data Scientists gain first-hand experience of sampling techniques and data processing methodologies. This improves our efficiency when ingesting the data into the National Oceanographic Database (NODB). They also help coordinate metadata (information about data) collection, which saves us a lot of time when the data arrive at BODC. Working alongside colleagues in testing and tiring conditions improves their understanding of how inaccuracies in metadata might occur and developing a good relationship with the scientists, the ship's technicians and students helps remedy these issues. 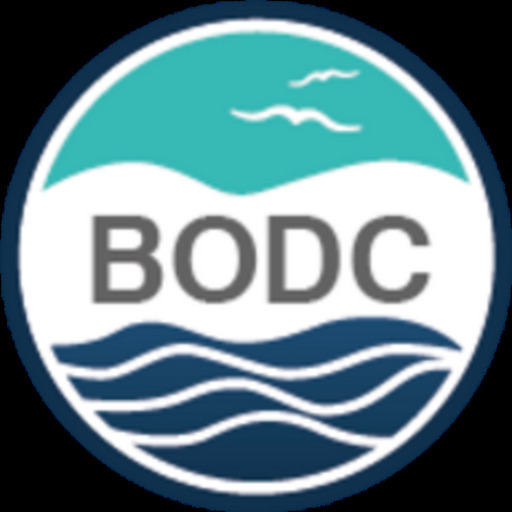 Ultimately this aids BODC towards its goal of providing a large and accessible marine data resource for the scientific community and the general public.